You cannot wait to meet your baby, but aren’t sure how you’ll adjust to this huge life transition. You anticipate needing some extra loving support during those early weeks. Maybe you just moved to the Seacoast or don’t have family nearby. Maybe your partner needs to return to work shortly after the birth. Maybe you do have family support, but want support from somebody trained and experienced, who will support you unconditionally. Perhaps you just had your baby and you’re feeling overwhelmed. I can help you process your emotions about your new role and serve you so that you can focus on healing, resting, and bonding with your baby. Second-, third-, fourth-time mothers, etc. You have other children to take care of, but want to be gentle with yourself in the first weeks after your new baby is born. Your first experience postpartum was overwhelming and now you have a better idea of what your needs are. If you had a cesarean section, you will need to be especially gentle with yourself and your mobility will be quite limited at first. I will make sure that your chores are taken care of so that you can rest and heal. I will help you set up your home so that everything you need is close by and you don’t have to go far for anything you need. The first days and weeks with a new baby are experienced differently by every family. While there are often moments of bliss, it can be overwhelming and challenging to adjust to your new role while also recovering from giving birth. Your hormones are readjusting and you and your family are readjusting to a new normal. I trust you and the decisions you make as a mother. Just like labor support, I can help you during the postpartum period by working with you and your family to create your ideal home environment; one that will allow you to tune into your instincts, trust yourself and mother with confidence. There are so many questions and decisions to make when you have a new baby. Where should my baby sleep? How can I get my baby to latch better? Why does her breathing sound funny when she sleeps? How do I bathe him? I help you sift through the information, decide what is best for you, and unconditionally support you in your final decision. It’s my job and my honor to mother you, so that you can sleep, rest, eat well, and focus your energy on caring for and bonding with your new child. I will take care of household duties so that you can rest, knowing your home is clean and organized. If you have other children, I also support you to keep those relationships strong and healthy while you learn to care for another child. I vividly remember my postpartum days. There was snuggling and smiling. There was also confusion, overwhelm, and sadness, as I struggled to adjust to my new role with little time or ability to take care of myself. 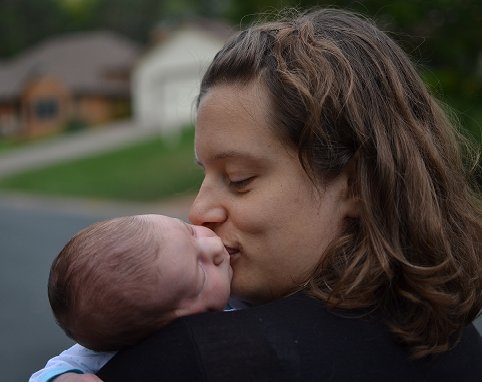 I understand the emotions and challenges that accompany the postpartum period. I would be honored to help you transition peacefully into motherhood. What if you could be loved, cherished, and unconditionally supported as you bond with your newborn so that you could transition into motherhood peacefully, trusting yourself and your natural ability to mother your child? As a doula, I specialize in supporting families through this transition. This is one of the most profound transitions you will experience. You will be so glad that you did everything you could to be gentle with yourself and optimize your time to bond with your newborn. You will be so happy to look back on your postpartum period knowing that, even if there were hard parts, your family experienced this transition gently and peacefully. And the confidence you develop in your mothering abilities during the early days will serve as a strong foundation during the rest of your mothering years. Your family deserves the most professional and supportive care possible.